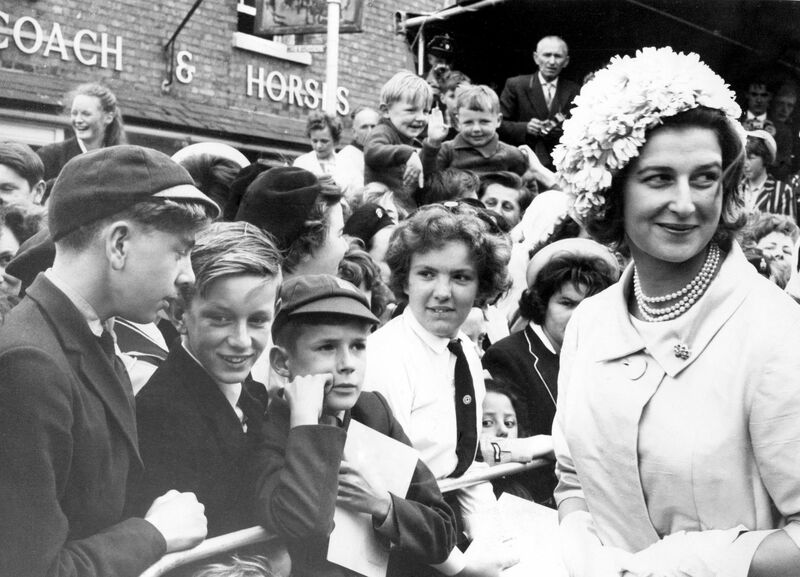 to June 21, 1962 and the arrival of Princess Marina and her daughter, Princess Alexandra, to Royal Ascot. I adore the shape and austerity of Princess Marina’s straw upswept design and must concede that Princess Alexandra’s floral helmet/turban is one of the most attractive iterations of this odd shape I can remember. I’d be remiss here not to also mention the striking resemblance between mother and daughter- quite remarkable. Thanks for sharing current royal hats while I’m away from the blog- you can do so again today in the comments. This entry was posted in Ascot, Vintage: Hats From The Past and tagged Princess Alexandra of Kent, Princess Marina. Bookmark the permalink. Princess Marina’s elegance certainly rubbed off on her daughter. Both these royals represent a certain allure that is probably as much about their attitude as it is about their style. Always worth viewing. This is the first time ever I have seen one of these floral helmet/turban aberrations look remotely attractive. Princess Alexandra wearing it an angle was inspired. Princess Marina looks chic as always. The resemblance between mother and daughter is so striking here. I think that the turban hat looks better than usual because it is worn at a slight angle. In most pictures I have seen the ladies are wearing the hat centered on the head/face and it all too often looks like a bathing cap. This is better! Exactly. the angle and loose hair avoid the bathing cap look. Princess Marina epitomised natural elegance all her life, And her daughter – everyone’s favourite Royal – has followed in her footsteps. The following photo was taken a week later, at Stratford-upon-Avon. The 3rd lad doesn’t seem entirely convinced with this millinery choice! The following video, charming as it is, only briefly shows us the color of Alexandra’s hat – very pale yellow. It appears at 1:09. HQ: Sorry, I thought I embedded the link to the photo, not the photo itself. Mea culpa! The apple didn’t fall far from the tree did it. Two of my all time favourites, Marina in particular was just stunning and so chic when young, for me she epitomises 30s glamour. This is a typically great showing from both of them. Exactly JamesB! I think all of us have a secret obsession with Princess Marina. She was so glamorous. Both ladies rarely put a foot wrong fashion wise, and it’s always a thrill to see photos of them on this blog.